ETR Single Row Cylindrical Roller Thrust Bearing 81248-M, Brass Cage High precsion, other type can be available with us. Cylindrical roller thrust bearings are simple in form and design, they are produced in single row and double row designs. The bearings in the 811 and 812 series are mainly used where thrust ball bearings have insufficient load carrying capacity. Series 811 and 812 consist of a thrust cylindrical roller and cage assembly, the shaft washer and the housing washer. 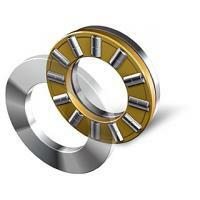 The most vital component of the bearing is the thrust cylindrical roller and cage assembly. The modified line contact eliminates edge stresses at the roller ends. These are thrust bearings containing cylindrical rollers. They can sustain only axial loads, but they are suitable for heavy loads and have high axial rigidity. The cages are machined brass. Application Places Oil rig, iron steel making machinery, hydroelectric generators, vertical motors, marine propeller shaft, tower cranes, extruders, etc. 1. We are OEM factory,cooperating with most of the famous brand OEM factories. 2. We supply the competitive price with quality guaranteed. 3 Providing customers with high quality products and unparalleled service. 4. Devoting for clients to seek more effective,more economical way to solve problems. 5. Paying more attention to the mutual respect between people and our nature.